It wont matter anyways since he is going to lose there. Darkrai 888 and Pokegirl Fan~ like this. Ash should have at best an over-glorified defeat like the previous league. I want to give the kid some pity for being such a loser. Johto ring any bells? Granted, Ash leaned heavily on both Snorlax and Charizard, but he went in with a team where he only had one evolution, while Noctowl was caught as it was. So considering how Ash now has Lycanroc and Torracat, that's already tied in a sense - with the big exception that in this series each pokemon has an easy nuke.. You couldn't say that about Totodile or Phanpy, heck.. Cyndaquil didn't even really have a finishing move..
My bad. That was just me trying to make that sound illegal and a joke. Ha ha. Exactly, a Pokemon becomes more powerful when the writers want it to. Besides that evolutions are rarely pivoted through hard work by the trainer in the anime anyway, they're DEM power boosts. 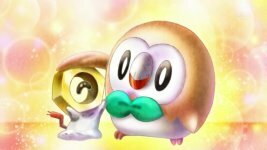 Did Mallow have to train Bounsweet remotely for her to evolve, BOTH TIMES? While Ash can at least sometimes earn new moves and Z Crystals, evolutions tend to just be something he GETS. I wonder who Eevee intends to meet? Since it will eventually join the school I doubt it has a trainer. Probably a fellow Pokemon. Biggest shock of the series: Eevee is going to find Guzma. Maybe it has come to meet Litten/ torracat!! I don’t think Eevee has any intentions to meet anyone and will end up wherever it ends up. And it’ll eventually join the group anyway upon a chance meeting. Yeah but the summary kind of made it seem he was looking for someone in particular. I know it sounds like a stretch but that Eevee could get as strong as Virgil's so I don't see no problem in him not evolving... and Ash desperately needs a new pokemon, anything will suffice atm. ash&charizardfan, Pokegirl Fan~ and Mew2 like this. As I said in another thread, I would love to see Leaf appear in the animé and be the one to beat Ash and possibly (hopefully) win the Alola League. It would be the first time a game character, much less a player character (in some timelines) was the one to crush Ash's dream. And, to me, that would make his losing a bit more palatable. I think you all mean Ember. I still don't think Eevee will be caught and that he'll just be a travelling companion Pokemon who agrees to help out sometimes as he travels with them on his way there (to thank Ash and Co for helping it here possibly?). The 'Going To The End Of The World' part is intriguing, though wonder what that means. Either way it's good he finally appears, i also wonder who it is Eevee is meeting. EDIT: Although i'd like it if it was the Alolan Persian Tsareena defeated in SM083 (means possible Mallow and Tsareena focus) I hope it's the Alolan Persian that Torracat once had a problem with when he was still a Litten (with Torracat knowing Revenge, that Persian better watch out now! xD).